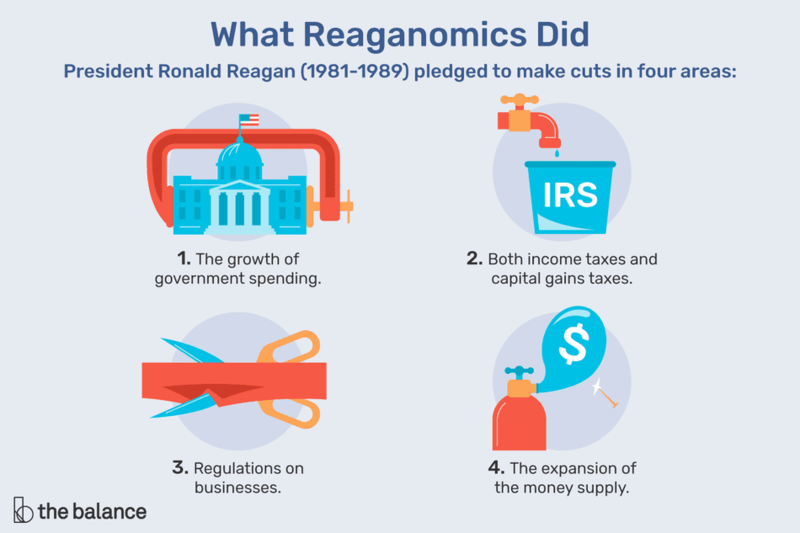 Reaganomics: Definition, Did It Work? What Is Reaganomics? Did It Work? Would supply side economics work today? Reaganomics is President Ronald Reagan's conservative economic policy that attacked the 1980 recession and stagflation. Stagflation is an economic contraction combined with double-digit inflation. It promised to reduce the government's influence on the economy. He supported laissez-faire economics. He believed the free market and capitalism would solve the nation's woes. His policies matched the "greed is good" mood of 1980s America. Reagan's position was dramatically different from the status quo. Prior presidents Johnson and Nixon had expanded the government's role. The growth of government spending. Both income taxes and capital gains taxes. The expansion of the money supply. Reaganomics is based on the theory of supply-side economics. It states that corporate tax cuts are the best way to grow the economy. When companies get more cash, they should hire new workers and expand their businesses. It also says that income tax cuts give workers more incentive to work, increasing the supply of labor. That's why it's sometimes called trickle-down economics. But government spending wasn't lowered, just shifted from domestic programs to defense. The result? The federal debt almost tripled, from $997 billion in 1981 to $2.857 trillion in 1989. Tax Cuts. Reagan cut tax rates enough to stimulate consumer demand. By Reagan's last year in office, the top income tax rate was 28 percent for single people making $18,550 or more. Anyone making less paid no taxes at all. That was much less than the 1980 top tax rate of 70 percent for individuals earning $108,000 or more. Reagan indexed the tax brackets for inflation. Reagan offset these tax cuts with tax increases elsewhere. He raised Social Security payroll taxes and some excise taxes. He also cut several deductions. Slow Spending Growth. Government spending still grew, just not as fast as under President Carter. Reagan increased spending by 2.5 percent a year, mostly for defense. Cuts to other discretionary programs only occurred in his first year. Reagan did not cut Social Security or Medicare payments. In fact, Reagan's budgeted spending was 22 percent of the gross domestic product. That's higher than the standard 20 percent of GDP. But, the growth in spending was less than President Carter's 4 percent annual increase. These figures are adjusted for inflation. Reduce Regulations. In 1981, Reagan eliminated the Nixon-era price controls on domestic oil and gas. They constrained the free-market equilibrium that would have prevented inflation. Reagan also deregulated cable TV, long-distance telephone service, interstate bus service, and ocean shipping. He eased bank regulations, but that helped create the Savings and Loan Crisis in 1989. Reagan increased, not decreased, import barriers. He doubled the number of items that were subject to trade restraint from 12 percent in 1980 to 23 percent in 1988. He did little to reduce other regulations affecting health, safety, and the environment. Carter had reduced regulations at a faster pace. Tame Inflation. Reagan was lucky Federal Reserve Chairman Paul Volcker was already in place. Volcker vigorously attacked the double-digit inflation of the 1970s. He used contractionary monetary policy, despite the potential for a double-dip recession. In 1979, Volcker began raising the fed funds rate. By December 1980, it was at a historically high 20 percent. These rates choked off economic growth. Volcker's policy triggered the recession of 1981 to 1982. Unemployment rose to 10.8 percent and stayed above 10 percent for 10 months. Today's conservatives prescribe Reaganomics to make America great again. President Donald Trump, 2012 Tea Party followers, and other Republicans advocate it as the solution the economy needs. But the theory behind Reaganomics reveals why what worked in the 1980s could harm growth today. Reaganomics and supply-side economics can be explained by the Laffer Curve. Economist Arthur Laffer developed it in 1979. The curve showed how tax cuts could stimulate the economy to the point where the tax base expanded. It showed how Reaganomics could work. Tax cuts reduce the federal budget, dollar-for-dollar, immediately. These same cuts have a multiplier effect on economic growth. Tax cuts put money in consumers' pockets, which they spend. That stimulates business growth and more hiring. The result? A larger tax base. But the effect that tax cuts have depends on how fast the economy is growing when they are applied. It also depends on the types of taxes and how high they were before the cut. The Laffer Curve shows that cutting taxes only increases government revenue up to a point. Once taxes get low enough, cutting them will decrease revenue instead. Cuts worked during Reagan's presidency because the highest tax rate was 70 percent. They have a much weaker effect when tax rates are below 50 percent. For example, President Bush cut taxes in the 2001 Economic Growth and Tax Relief Reconciliation Act and the 2003 Jobs and Growth Tax Relief Reconciliation Act. The economy grew and revenues increased. Supply-siders, including the president, said that was because of the tax cuts. Other economists pointed to lower interest rates as the real stimulator of the economy. The Federal Open Market Committee lowered the fed funds rate from 6 percent at the beginning of 2001 to 1 percent in June 2003. The fed funds rate history illustrates how this decrease progressed throughout the years.